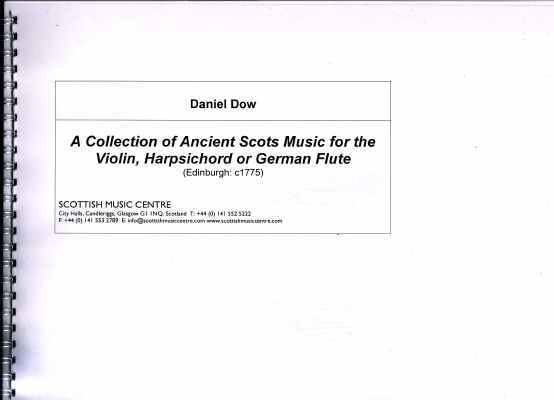 A Collection of Ancient Scots Music for the Violin, Harpsichord or German Flute Never before printed, Consisting of Ports, Salutations, Marches or Pibrachs &c.
This book contains a selection of old Gaelic music from the pipe, fiddle and clarsach repertory, set with basses for harpsichord or small ensemble. Many of the old clarsach pieces are unique to this book, or appear here in better sets than elsewhere; some have fully written out variation sets. If you ignore the bass then it is an extremely useful resource for advanced early clarsach repertory. The reproduction in this spiral-bound facsimile is reduced though reasonable; the presentation and binding is very basic. Click here for info about the book including contents etc.